LDC Spotlight - Christian Assistance Program - Arundel Community Development Services, Inc. This month, we are highlighting the great work that the Christian Assistance Program (CAP) has been doing to provide food assistance to those in need. CAP is a private nonprofit food bank providing food and clothing assistance to less fortunate residents in West County. Utilizing LDC funds, CAP provides grant vouchers to households living within the LDC target area to purchase grocery items such as fresh dairy products, fruits, vegetables and frozen produce. 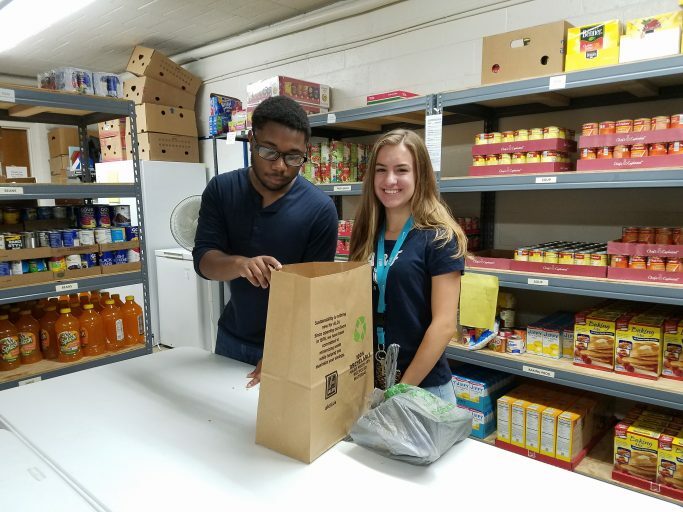 Pictured Above: Volunteers at the CAP Food Pantry assist with tasks like stocking shelves, packing grocery bags with food and loading food into client vehicles. More than 50 volunteers support the CAP Food Pantry, ranging in age from 13-83! CAP supports families in need – regardless of faith or religion – to achieve greater food security. Their clients include all races/ethnicities, while approximately 50% of the persons served by CAP are under 18 or 65 and older. Most CAP clients visit the pantry several times a year; many come in every month, and a small number are one-time clients. Between September 2018 and January 2019, the CAP Food Pantry served an average of 157 households, or 466 individuals, each month. During the recent government shutdown, CAP provided support to several families that had not come in for assistance before. since I first started receiving assistance…Going hungry for days is hard. Painful. The CAP Food Pantry is located at 1215 Camp Meade Road in Severn and is open Tuesdays 11am-1pm and Thursdays 3pm-5pm. Those interested in lending a hand should contact Jean Case at 410-570-6926 or jcase928@gmail.com.